Avoiding urban sprawl and ensuring that development takes place where adequate facilities exist or can be provided in a timely, economic and efficient manner. Settlement patterns that minimize the use of automobiles and encourage walking, bicycling and the efficient use of public transit. The efficient movement of goods and people while making effective use of transportation and utility corridors. Maintaining the integrity of a secure and productive resource base, including the agricultural land reserve. Economic development that supports the unique character of communities. Reducing and preventing air, land and water pollution. Adequate, affordable and appropriate housing. Adequate inventories of suitable land and resources for future settlement. Protecting the quality and quantity of ground water and surface water. Settlement patterns that minimize the risks associated with natural hazards. Preserving, creating and linking urban and rural open space, including parks and recreation areas. Planning for energy supply and promoting efficient use, conservation and alternative forms of energy. Good stewardship of land, sites and structures with cultural heritage value. A regional growth strategy can cover a good deal of ground, and our region’s strategy covers many of these goals. Two of the tools used in our regional growth strategy to accomplish these goals are regional land-use designations and an Urban Containment Boundary. The primary purpose of the Urban Containment Boundary is to limit sprawl, and preserve green-space and employment lands. All municipalities must submit Regional Context Statements to the Metro Vancouver Regional District board for approval. These Regional Context Statements show how a municipality’s Official Community Plan aligns with the regional growth strategy. The Township of Langley’s Regional Context Statements were subject to a dispute resolution process which completed in October 2016. It was the last municipality to have these statements approved. In addition, there has been other minor amendments to regional land-use designations in other municipalities. The regional district is now moving forward with updating the land-use maps included in the regional growth strategy. The following is the current regional land-use map for the South of Fraser. Current Regional Land-Use Map for the South of Fraser. Select map to download. The following is the proposal regional land-use map. 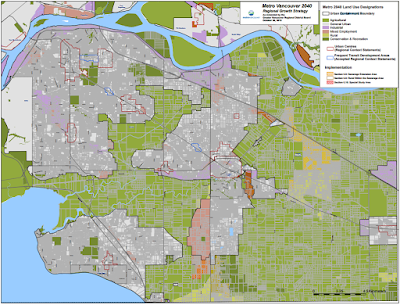 Proposed Regional Land-Use Map for the South of Fraser. Select map to enlarge. As you can see, there is not much difference. The Urban Containment Boundary does change around Campbell Heights, Trinity Western University, and Murrayville. Urban sprawl happens slowly, parcel by parcel. The Urban Containment Boundary helps hold the line. Earlier this year, the regional district asked member municipalities if the current regional growth strategy was effective. The generally consensus was that it is effective. The current update to the regional growth strategy maps does show the Urban Containment Boundary being pushed out, but it was a long process for that to happen. While no plan is perfect, the current regional growth strategy appears to be working well in limiting sprawl.